Having laid the foundation of Maheshwari Public School (MPS) in 1977 , Dr. Ashok Gupta became, at the age of thirty, one of the youngest Principals in the school education system. He worked incessantly for fourteen years to make it one of the best schools in the state. His long association with the MPS helped him acquire not only an insight into the working of educational institutions but also an expertise in running them professionally and profitably. He used this acumen and understanding to establish India International School, the first institution under the banner of ICFIA (Indian Council for International Amity). 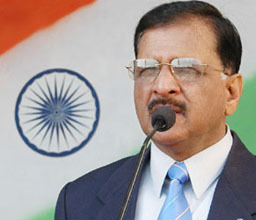 Thereafter, he established the International College for Girls and International School of Informatics & Management in 1995, The Play House in 2001, IIS Centre for Information Technology in 2002, FM Radio7 in 2005, ICG Institute of Educational Research & Development in 2006 and International Institute of Management, Engineering & Technology in 2008. All the institutions aim at imparting quality education and can boast of an enviable infrastructure raised to ensure it. Dr. Ashok Gupta’s penchant for perfection has elevated them to temples of learning where education is a commitment and the training of the whole person a mission. Dr. Ashok Gupta is the founder Director of The Play House, India International School , IIS Centre for Information Technology, International College for Girls, International School of Informatics & Management & FM Radio 7, ICG Institute of Educational Research & Development, International Institute of Management, Engineering & Technology. He is an eminent educationist who has made unforgettable contribution to restore the richness of educational culture and to make it more vibrant than before. His farsighted leadership, commitment to work, penchant for perfection, high concern for students and the breadth of vision has elevated the institutions to a center of learning where education is a commitment and the training of the whole person a mission. Dr. Ashok Gupta has, to his credit, a number of achievements in diverse areas including prestigious awards at national and international levels. 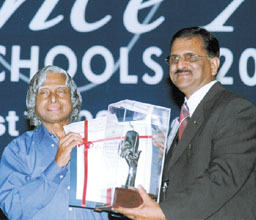 Awarded for special contribution in the field of education by ‘Rajasthan Patrika’ during Rajasthan Patrika Golden Jubilee Celebrations on 23 February, 2006. 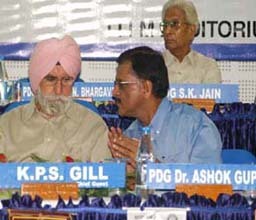 Chairman, Organizing Committee, International Seminar on Water Management held at Jaipur in November 2006. Attended by RI President Bill Boyd. Technical Coordinator for the Humanitarian Grants Cadre of Technical Advisors 2006-09. Rip Rep to RID 3770 Philipines 2006-2007. "Service Above Self Award" by the Rotary International USA, 2002-03. Awarded as Distinguished Past District Governor of RI in Zone 5 at the Rotary International Convention held in Barcelona, Spain. 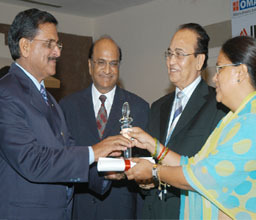 Distinguished Service Award by the Rotary Foundation 2005. Nominated as one of the thirty nominees for the internationally recognized ERNST AND YOUNG ENTREPRENEUR OF THE YEAR AWARD 2003 out of six hundred applicants. India at more than 30 International Conferences held in USA, UK, France, Australia, Japan, Austria, Indonesia, Malta, China, Canada, Spain, Belgium, Finland, Czech Republic, Poland. Also visited : Italy, Germany, Denmark, The Netherlands, Greece, Switzerland, Iran, Thailand, Malaysia, Singapore, Hong Kong, UAE, Kuwait. Dr. Gupta made appreciable contribution to the society during his tenure as the District Governor of Rotary International District 3050. He was responsible for the successful implementation of the “Drinking Water Project” for 30,000 villagers in Dudu area .He is also closely associated with the Trauma Hospital, Dudu. He is Past District Governor of Rotary International Distt. 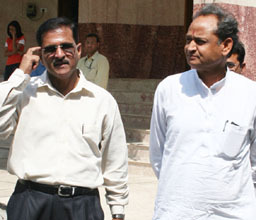 3050 comprising 158 clubs in the states of Rajasthan, Gujarat and Madhya Pradesh.